There seems to be some inconsistency in how to zoom: When viewing photos, you pinch to zoom in and can double-tap to zoom all the way out; in the Maps application, however, a double-tap zooms in, while a two-finger touch zooms out. Where is the option to set an iTunes song as a ringtone? I smell meddling corporate interests. Gilliwind Islandsong, as performed by ARRR!!! 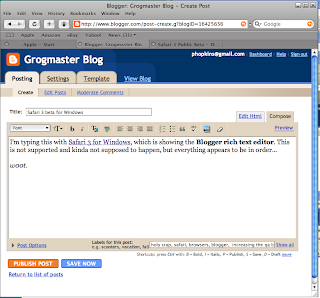 I'm typing this with Safari 3 for Windows, which is showing the Blogger rich text editor. This is not supported and kinda not supposed to happen. Update: If you're following along at home, Safari 3 does not implicitly create a <head> element when you programmatically (e.g. with document.write(...)) set the contents of an IFrame. This causes an initialization error in the Blogger post editor because there's no place to stash the <style> tag for spellchecking, which throws off the autosave initialization. Without autosave, image upload to draft posts doesn't work, since Blogger autosaves before showing the upload dialog. Another update: Damn Safari 3 is speedy-quick. It is now a contender for browser-of-choice. If you’ve still have the Blogger Mac OS X Dashboard widget running, you may have noticed it pop up a little message this evening. Apologies to everyone who was left waiting for me to update the widget to work with the new Blogger’s Google Accounts and Atom 1.0. 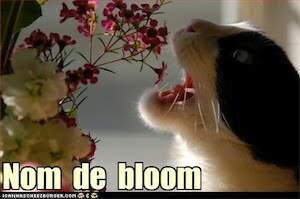 Now that the dropped ball has been picked up, happy Dashboard-blogging! Through the many magicks of the Internet and Facebook’s new application platform, I am available for Rock Paper Scissors challenges.